Los Angeles, CA’s Weezer will release their highly anticipated ninth album, Everything Will Be Alright In The End, on September 30 2014 on Republic Records. Produced by Ric Ocasek, who previously helmed production on the band’s first and third records (The Blue Album and The Green Album), Everything Will Be Alright In The End is the band’s first collection of new material in four years. Since forming in 1992, Weezer has released a myriad of celebrated, chart-topping albums, selling over 13 million records worldwide. Following an intensely prolific couple years at the end of the aughts, the band chose to deliberately dial down the tempo in 2010, a move singer/guitarist Rivers Cuomo says allowed him to write at a slower pace, giving the songs he wanted to use for an album the time to gradually grow into their final forms. He started almost every song on the piano, eventually transferring them to the guitar before taking them to the band. When it came time to record the material, Weezer reunited with the man who helped them make some of their most iconic album-length work, Cars frontman Ric Ocasek. 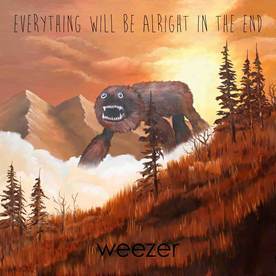 The resulting album, Everything Will Be Alright In The End, is a stand-out gem in Weezer’s vast and varied catalogue, a reflection of a much-loved band at their very best. Organised thematically around three groups of songs, it is an album that utilises that sound from the band’s earliest days to tell new stories in 2014, creating some of the finest, most heartfelt songs Weezer has ever recorded. Weezer have revealed the first track from the record, Back To The Shack, which can be heard here.